It's been really fun for me to have home decorating projects again. I think after the first year in Arizona I just gave up on the place. I made it look as good as I could and decided I wasn't going to waste resources on it anymore. (I am sure that those of you who lived on base with me will agree there's not much to be done in those old houses!) So, here are a few of the things I've done lately, although I only have pictures of one project. Furniture: I inherited my grandmother's old dinette set and hutch. The first line of business was to give them a makeover. 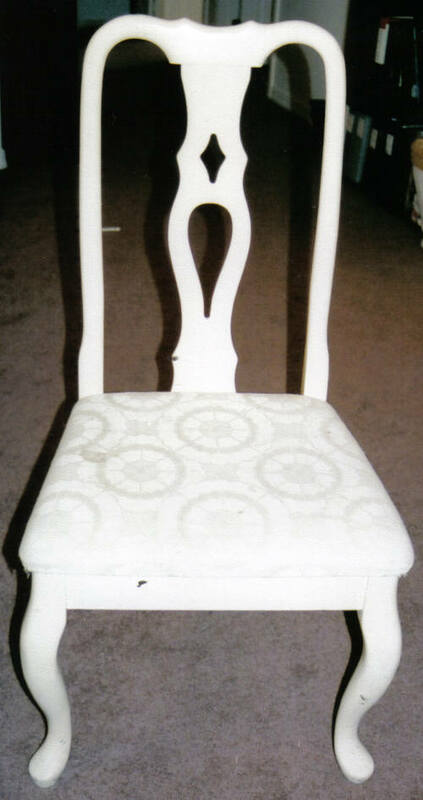 It is pretty old and the paint was chipping a bit, and some of the chairs were discolored (I assume because of where they were in relationship to windows) and most of the seats were stained. 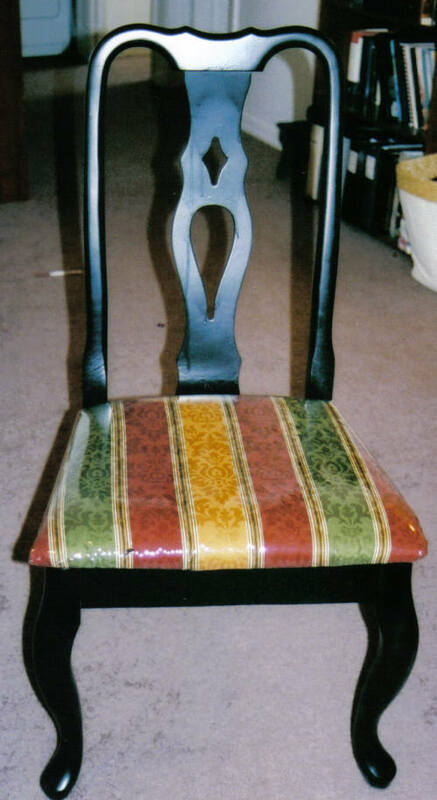 Project: It took me several weeks, but I found the perfect fabric to recover the chairs in. I also added the plastic stuff so they are easy to keep clean. I spray painted everything black. The hutch was a huge annoyance to do...I'm thinking I'm never painting a hutch again. Ever. But, I do love the end result. 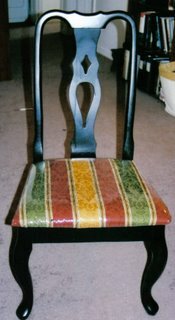 These are the before and after pictures of my chairs. Today I plan to use the extra fabric from covering them to make a valance for the dining area window. Furniture: Entertainment Center. I finally got rid of my rundown entertainment center in Arizona. Here, I found a great piece of furniture at DI for 25 dollars. It's a tall shelf (perfect since we have vaulted ceilings in the living room and I needed the height) and I thought that our TV would fit perfectly in it. Wasn't sure, so I went home and measured and came back the next day with my measuring tape. Perfect was right...seriously, there is barely space on each side and it fits exactly front to back. And, to top it off, DI had lowered the price to 15 dollars! Project: I will admit, it didn't look like that great of a shelf. It was filthy and scratched. But, with a little cleaning up and shellacking it looks like I might have purchased it at Pier 1. Now I just need to buy some more IKEA DVD basket holder thingies (I had one already). But, alas, IKEA does not sell this particular item online, only in the stores. Hopefully my mom can pick up some for me while she's in Seattle in a couple weeks. Then it will be perfect and all our DVD/Videos will be nice and hidden. I am also going to paint our CD holder things a darker color to match the wood. One stands on either side of the shelf to make it look more substantial. Furniture: Dresser for our room. I finally found a good one at DI...25 dollars this time. Gave Sophia the one Joel had been using (it's a dresser bought at a garage sale when I was pregnant with Bria. It was fixed up for her arrival in the first place, and is perfect for a baby's room). Project: Haven't started yet. This will be something I do this month though, slowly but surely. The dresser is UGLY. Someone painted the drawers the ugliest tan color imaginable, and the rest of it is painted dark brown. 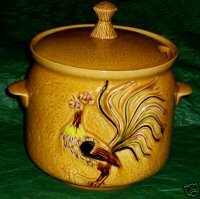 The pulls are hideous. But, it's sturdy, in great condition and made of solid wood. I'm going to strip it and stain (not paint) it black. Get some fancy pulls that I like and I think it will turn out beautifully. Going to have to do this one drawer at a time, and then get the whole dresser after that. Fun stuff. It's kept me busy, but my creative juices are being all used up here and I haven't done much scrapping. Ah well, I'll have a much nicer looking house to scrap in soon enough. Seeing some serious tithing blessings in this entry. You do your part (paying tithig, and being willing to fix stuff up) and you can still have an amazing house. Awesome projects!! Nice job!! WOW! Wow! Those are very nice!! !